Have a question about the XS Scuba Pony Pac Tank Harness? Great For A Beginning Diver As Young As Ten Years Old. Great devise for the boat, beach dives, swimming pool maintenance, or ocean kayaking, the XS Scuba's PonyPac Harness is one versatile harness. You're out boating and the anchor gets snagged, just roll over the side with this lightweight and easy to handle PonyPac and un-snag you're anchor. Want to do a short beach dive without all that extra weight of a large cylinder, work on the drain, pool light, or filter outlet in the pool, or maybe you see something interesting on the bottom while you're out on your ocean kayak, whatever your it maybe when you need a lightweight easy to use cylinder harness the PonyPac is what you are looking for. 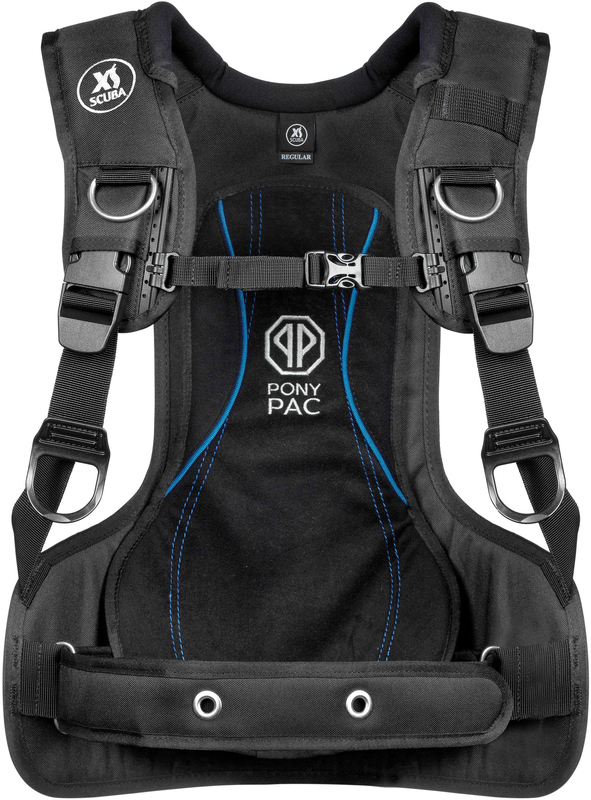 The PonyPac is a comfortable harness designed to carry a pony cylinder. It fits 13 to 40 cu ft cylinders. Harness is equipped with two-way adjustable sternum strap, dual-cam strap attachment, neoprene neck collar and back pad for added comfort, and has two trim weight pockets that hold up to 5 lbs each. Perfect harness so my 9 year old can scuba dive in the pool with me. I am an instructor so don't yell at me, doing some discover scuba experiences. Nice not to have the tank rolling around and regulator bonkin her head. Makes for a good experience that will take her o the next level::::Open Water Diver. Can't wait to go diving with my kid!! on 2/18/2011 Does Pony Pac Harness itself already include a belt, strap(s) or something else which fixes the cylinder(19 cu.ft. pony bottle) to the Harness . This is not visible in the Internet advertising material which is available . on 2/18/2011 have a band on the back to hold a tank. on 2/18/2011 Yes, they do already come with a belt strap which fixes the cylinder to the harness. Fits 13, 19, 30, 40 cu ft pony cylinders with 4.0" - 5.4" diameters.